Empathy by Roman Krznaric is what I call ‘pop-philosophy’. Like the popular works of Bertrand Russell and Alain de Botton it’s easy to read, and it tackles the sort of every day philosophical issues that ordinary people think about it even if they don’t necessarily identify these preoccupations as philosophy. But whereas Russell wrestles with big picture issues e.g. as in Authority and the Individual where he explored the importance of balancing freedom with a well-ordered society, de Botton and Krznaric are more in the ‘lifestyle philosophers’ camp. De Botton has written about everything from travel to status anxiety (and I’ve browsed his books but never really engaged with them) while others in this camp are Damon Young whose Philosophy in the Garden is a booklover’s delight: it explores the gardens of great authors and how these gardens provided a refuge for thought and creativity. a cultural thinker and founding faculty member of The School of Life. He advises organizations, including Oxfam and the United Nations, on using empathy and conversation to create social change, and has been named by The Observer as one of Britain’s leading lifestyle philosophers. His latest title, Empathy is quick and easy to read, and I scampered through it in no time – his message is simple and unequivocal. Empathy is a good thing, and the world would be a better place if more people cultivated it. Along the way he provides evidence from neuroscience that not only does empathy exist but it can be measured, and also that it can be developed (except for sociopaths and people with Asperger’s Syndrome who lack the necessary wiring in the brain). He worries about social networking as a substitute for real conversation, and he thinks that the kind of travel that most of us do isn’t as helpful as it could be for learning to understand how the Other lives. What in your experience, are the best and worst ways of being good? What would you most like to change about your philosophy of love? How have your ambitions affected your humanity? What is your personal history of self-confidence, and what has it taught you? 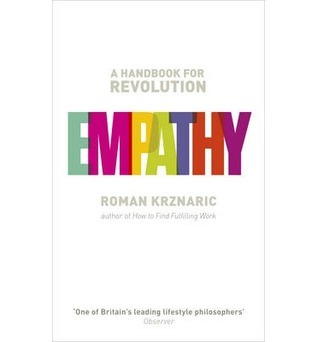 You can find out more about empathy at Krznaric’s website. I’ve just read the story about Empathy International in Angela Meyer’s collection … The other end of the stick! Love Jackie French’s statement. You mean in The Great Unknown? Yes, I know you’ve read it too … I’m only just getting to it now. I haven’t read all of it, you know me and short stories! LOL … The Empathy one is one of the first ones … I’m reading one a day and am not quite half way yet, but overall they’re very enjoyable. I’ve always thought that reading good fiction strengthens one’s empathy muscle. I think so too, and travel books as well sometimes. I love H V Morton’s travel books because even though they were written a long time ago, because he spent his time talking with the locals, they’re not just guide books.